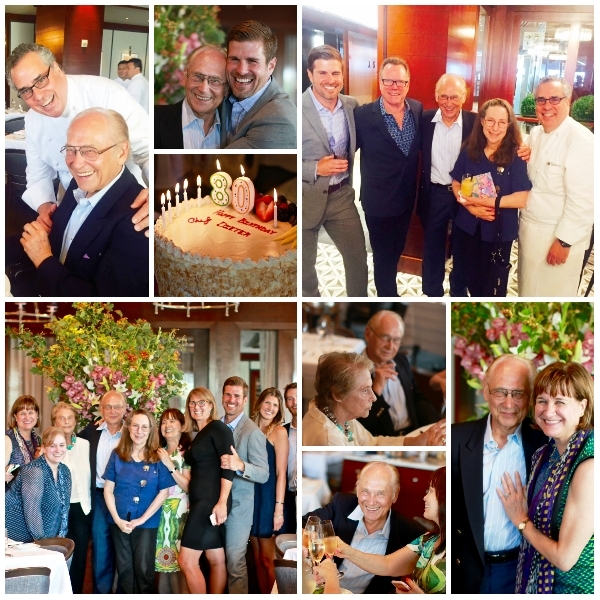 Dieter Schorner, a legend in the world of pastry, recently celebrated his 80th birthday when his wife Sylvie surprised him with a trip to Europe. So he was surprised to celebrate it again today, when a large table of his friends and admirers — including bestselling cookbook author Rose Levy Beranbaum and her husband Elliott, and former New York Times restaurant critic Mimi Sheraton, who once named Schorner one of the two best pastry chefs in America in the pages of Time magazine, gathered for lunch at Chef Michael Lomonaco‘s Porter House Bar & Grill to raise a toast to him. Sheraton recalled today her visit many years ago with a Times editor to Le Chantilly, where one taste of a tuile at dessert time prompted her to inquire, “Is Dieter Schorner your pastry chef now?” He in fact was — and her editor was blown away. She said identifying him was simple — everyone else used almonds for their tuiles, but only Dieter used hazelnuts. Rose Levy Beranbaum was in the midst of researching her next book when she realized she needed instruction in making danish, and started mulling over a trip to Europe. Instead, suggested Julia Child herself, why don’t you simply study with Dieter Schorner? And so she did — and the two have been friends ever since. Many know that we go way back with Dieter, whom we interviewed for our first book BECOMING A CHEF, which was first published in 1995. But our admiration for the former pastry chef of Le Cirque (where he introduced America to creme brulee) and La Cote Basque goes back more than a decade before that. In fact, Karen was one of his best customers during his brief stint at the chic Austrian patisserie on Wall Street called Die Fledermaus, which he joined back in 1984 — although she knew nothing of his restaurant-world celebrity status. She only knew that the pastries and desserts (including an extraordinary plum tart and chocolate ganache cake) she enjoyed there more afternoons than not when she wasn’t traveling for work were the very best she’d ever tasted — and always managed to bring a smile to her face even when the stresses of work and heartache could not. Having moved on from Wall Street in 1985, Karen had lost track of Dieter until the late 1980s when she was at graduate school at Harvard and ended up reading Mimi Sheraton’s article in Time magazine celebrating him (for which she thanked Mimi today!) — and was shocked to learn of her too-humble friend’s stellar restaurant world career before they’d met. As Sheraton’s article also mentioned that he’d opened his own Patisserie Cafe Didier in Washington, DC’s Georgetown neighborhood, it was only a matter of time until she made her way to DC to pay him a visit and reconnected. After Andrew first met Dieter and tasted his desserts, he figured out a way to spend a few days in his kitchen to learn from the master. While Dieter makes the best souffles we’ve ever tasted, ever since studying with him Andrew’s haven’t been so far behind (says Karen). Having traveled across the country on book tour after book tour, we’ve met countless CIA graduates who have studied with Dieter, and their reactions to our bringing up his name are inevitably ones of delight. Dozens if not hundreds of students have spoken to us of their awe of his talent and love of his humble personality and generous spirit. One we met today was Erin McDowell, a student of Dieter’s at the Culinary Institute of America who sang Dieter’s praises as a pastry world genius who inspired her along her path to coming out with her own first cookbook this fall called The Fearless Baker (Houghton Mifflin Harcourt, Oct. ’17). 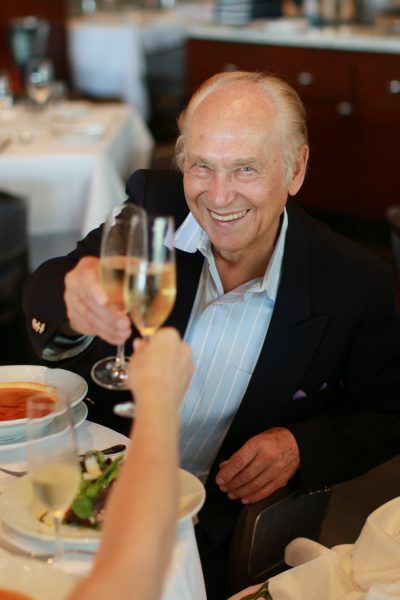 Our heartfelt best wishes to legendary pastry chef Dieter Schorner on this milestone birthday — and we look forward to toasting his 85th (or sooner!) with copies of this forthcoming book in hand! Pastry Art & Design magazine inducted Dieter Schorner into its Hall of Fame in 2008. He was owner of Patisserie-Café Didier in Washington, DC, until selling it in 1998, and the restaurant was named the third best in America by Condé Nast Traveler in 1994. Chef Schorner was previously executive pastry chef for Warner LeRoy at Potomac Restaurant in Washington, DC, and Tavern on the Green in New York City. He was also pastry chef at such distinguished locations as Le Cirque, Le Chantilly, La Côte Basque, and L’Etoile in New York; the Savoy Hotel in London; and Cafehaus Konig in Baden-Baden, Germany. In 1988, Time magazine called Schorner one of the two the best pastry chefs in the United States. Food & Wine listed him among “America’s Best Chefs” and Gourmet said Schorner “is one of the indisputable grand masters of his métier.” The native of Bavaria has prepared desserts for three U.S. presidents, and every day, his students have attested how lucky they are to continue to learn at the hand of this legendary pastry chef, mentor, and teacher.